Soil gets compacted when there’s too much solid matter in a certain volume or space. 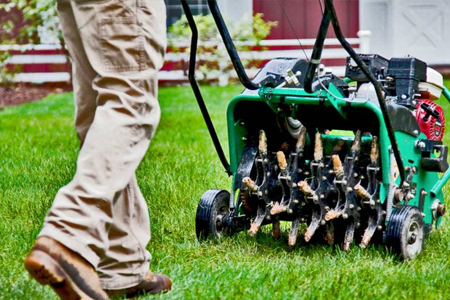 Why and when should you aerate? Usually, you perform aeration to alleviate soil compaction, allowing room for air, water and nutrients to get to the soil. Aeration should be done during the growing seasons when grass can fill any open areas after the soil plugs are removed. We recommend aerating lawns twice a year, preferably in the fall and spring. However, we do aerations year-round so don’t worry about the timing. We’ll be there when you need your lawn aerated. What are some other reasons why aeration is needed? Your lawn gets heavy use. Children and pets running around the lawn can contribute to soil compaction. Your lawn is part of a newly constructed home. Many times, the topsoil of newly constructed lawns is stripped or buried. The grass established on subsoil has become compacted by construction traffic. Your lawn was sodded and soil layering is present. Soil layering occurs when the soil of finer texture is poured over coarser, existing soil. This disrupts drainage as the water tends to stay on the finer part of the soil and not penetrate deeper. Aeration breaks up the layering and allows water to flow through the soil more easily and reach the roots.